Concrete is one of the hottest materials in kitchen design for 2016 and 2017, the interior design experts at the news and trends site InteriorZine.com recently wrote. While concrete has long been seen as a structural building material, it has begun to make its way inside the house of late. With an interesting texture and an excellent base color to pair with other elements, concrete is now all the rage. Lending further credence to this concrete trend, the company AlnoCera Concretto took home the German Design Council’s 2016 award for “Excellent Product Design – Kitchen” for its KH System Mobel design, which relies heavily on concrete both on countertops and even cabinet faces. Concrete kitchen designs provide a happy medium between kitchens with overly bright and exuberant colors and ones that are dark and moody. Instead, concrete provides a sophisticated backdrop that combines well with any secondary colors or textures. Looking for something more colorful? 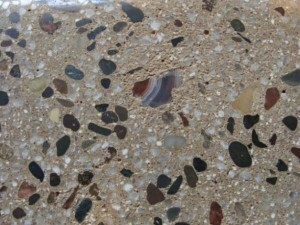 Concrete can easily be shaded, as well, allowing you to select a hue that best matches the rest of your kitchen décor. The material is also solid and provides an alternative to the granite countertops that have long been in style, but some experts believe have become overused in modern design. Concrete also adds the benefit of being easy to clean and durable, making it a lasting choice for your kitchen. As you think about remodeling your kitchen or if you are moving into a new home, look to concrete as a modern and stylish way to improve the look and feel of your kitchen along with enhance any of the other design elements you wish to implement. To learn more about adding a concrete countertop to your home or business, give Templin Concrete Construction a call today at 612-388-1945.